Josh Daum – writer, gamer, goober. By the time Josh Daum got to high school, he knew what he wanted to do with his life: become a high school band director. Since this is a blog about writing, you can imagine that it’s been a bumpy road since then. He finished his associate’s degree at the western campus of Cuyahoga Community College, and spent some time just living and working and seeing what was good. After three years, he decided to go back to school, having finally figured out what he wanted to do with his life: become a high school band director. (Again, Burning River Writing, not Burning River Band Directing, so you can see we’re not done yet). After a semester and a half at Baldwin-Wallace College as a declared English major (it’s a long story — suffice to say that Josh was about as good at scheduling auditions as he was at picking a career), he finally recognized his passion for language and writing as a passion, and discovered what he wanted to do with his life: write. In 2012, Josh graduated from Baldwin-Wallace College with his bachelor’s degree as a double major in English and Religion. 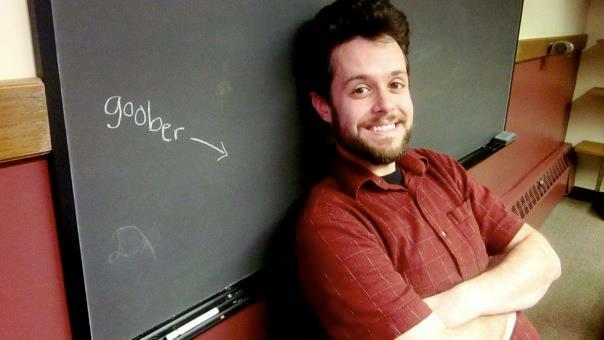 Josh has written the very (very very very) slightly successful (and now defunct) Foodgeek Blog, and is published in the 2012 edition of the Baldwin-Wallace College literary magazine, the Mill. He was also the winner of the 2011 A.W. “Bud” Collins, Jr. Prize in creative writing, and the 2012 Dr. Ernest Knautz Award for excellence in religious studies. Josh lives in Cleveland Heights with his wife.